HOTEL GIARDINETTO, PETTENASCO http://www.lagodortahotels.com/. 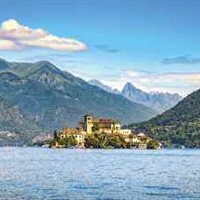 In a peaceful spot on the lakeside and a couple of miles from Orta San Guilio, here is an upmarket hotel with everything for a great holiday. Heated swimming pool, private beach, restaurant with veranda on the lake. Fully equipped bedrooms served by a lift. It is due to become a 4 star hotel in 2019.